Calendar: «International Day to End Obstetric Fistula». «Think of what they’ve gone through» illustrated quotation. Obstetrical fistula, free quote pictures for Facebook, Twitter, LinkedIn, Reddit, Pinterest and other social networks. 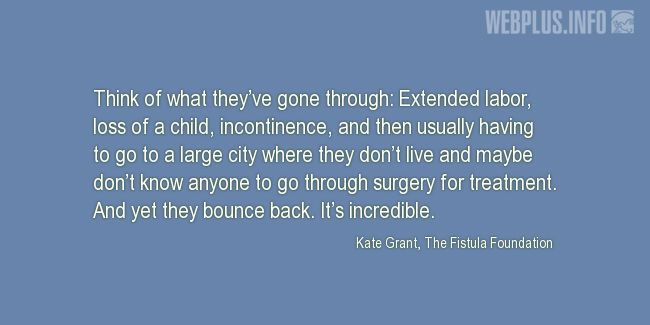 Think of what they’ve gone through: Extended labor, loss of a child, incontinence, and then usually having to go to a large city where they don’t live and maybe don’t know anyone to go through surgery for treatment. And yet they bounce back. It’s incredible.